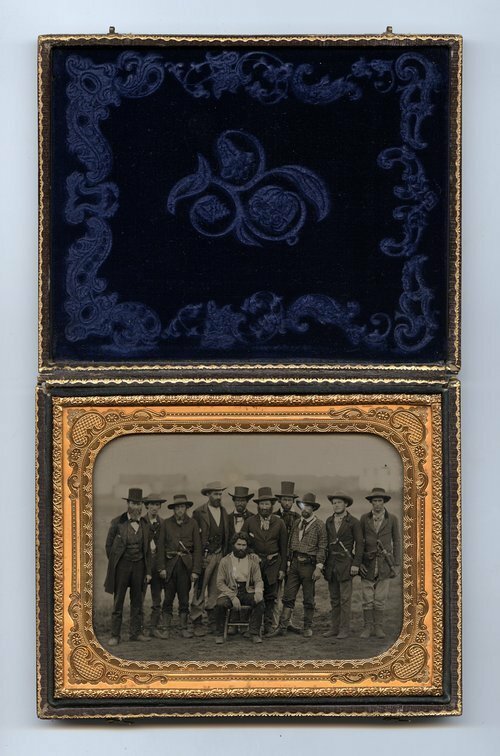 This ambrotype shows John Doy and his rescue party. On January 25, 1859, Dr. John Doy and his son, Charles, left Lawrence, Kansas Territory, for Nebraska with thirteen slaves. They were captured twelve miles outside of Lawrence and were taken to Weston, Missouri. The two Doys were arraigned at Weston and were committed to jail at Platte City, Missouri, for the crime of abducting slaves. They remained in jail until March 20, 1859, when they were taken to St. Joseph, Missouri, where Dr. Doy was tried. After the trial, his son, Charles, was set free. The jury could not agree on a verdict for Dr. Doy, however, and he was tried a second time. At the second trial, he was convicted and sentenced to five years in the penitentiary. While being held in the St. Joseph jail, Doy was freed by friends from Kansas Territory on July 23, 1859. People in the ambrotype are: (l to r) Major James B. Abbott, Captain Joshua A. Pike, Jacob Senix, Joseph Gardner, Thomas Simmons, S. J. Willis, Charles Doy, Captain John E. Stuart [Stewart], Silas Soule, George R. Hay and Dr. John Doy (seated in front). The ambrotype was taken at Lawrence, Kansas Territory, in the summer of 1859.